The first Grove GRT8100 manufactured outside the USA has left the production line in Niella Tanaro, Italy. Until now, the production of this crane model was exclusive to Manitowoc’s factory in Shady Grove, Pennsylvania, USA. 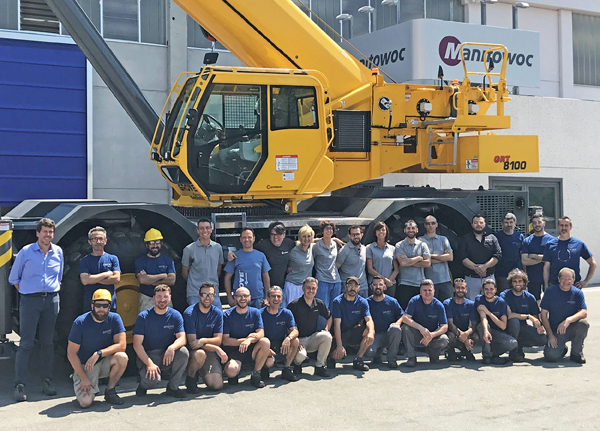 Since 2005, Manitowoc’s Niella Tanaro factory has manufactured other rough-terrain crane models, including the RT530E-2, RT540E and RT550E. An additional model, the 80t Grove GRT880, will also be manufactured in both Italy and Shady Grove by the end of the year. This project was made possible thanks to the successful and effective collaboration between the teams in Shady Grove and Niella Tanaro, Ennen added. The GRT8100 is a 100t capacity crane with a 47m five-section boom and features class-leading capabilities and Manitowoc’s Crane Control System (CCS). With a full complement of boom extension and insert options, the crane has a reach of up to 77m. This model made its debut at Bauma 2016. The first Italian-made GRT8100 was shipped to the Middle East at the end of June.